SOME yoghurts contain more sugar than a bar of chocolate. And a single yoghurt drink can contain seven teaspoons of sugar, a survey by the Irish Independent has found. We found that yoghurt products commonly added to children's lunchboxes as a healthy snack can contain as much as 30g of sugar. This comes just as the World Health Organisation is proposing we should aim to slash our sugar intake to 5pc of total energy in a bid to combat obesity and tooth decay. The highest dose of sugar we found was 30g in a Yoplait Yop yoghurt drink – equating to 7.5 teaspoons. 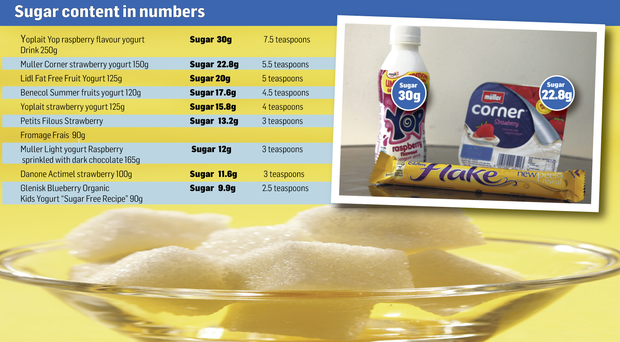 That's a whopping 66pc more sugar than you'd find in a Cadbury's Flake, which contains 18g of sugar, and it's also ahead of the 29.5g you'd find in a Dairy Milk bar. A Muller Corner yoghurt, meanwhile, contains 22.8g of sugar, which adds up to over five teaspoons-full. And while you might think you're going for a healthy option by choosing fat-free yoghurt, Lidl's Linessa fat-free yogurts contain 20g of sugar, or five teaspoons worth. Some of the sugars contained in yoghurt are naturally occurring in the fruit or milk, but many list added sugar, glucose-fructose syrup or fruit concentrates high up in the list of ingredients. Even a Glenisk organic kids yogurt that's labelled as having a "sugar-free recipe" also contains 9.9g sugar. The company said that these were naturally occurring sugars from fruit and milk, with some agave syrup to sweeten. "It's a balancing act in terms of health and nutrition and producing a product kids want to eat," said Glenisk marketing director Emma Walls. "As regards labelling, that's under review at the moment and we're looking to make some changes to improve transparency," she said. Nutritionist Anna Burns said that while yoghurt could be an excellent snack, she would never put yoghurt drinks in kids' lunchboxes and would avoid high-sugar yogurts except as a treat. "What I'm really opposed to is the marketing of these kind of products as a healthy snack that almost bullies parents into buying them when in fact you can be getting more sugar than in a Flake," she said. Ms Burns, who has written 'The Food Nanny' healthy eating guide for parents, said she would opt for good-quality plain or fruit yoghurts but avoid excessively sweetened varieties, except as an occasional treat. Yoplait maker General Mills did not respond to a request for a comment.